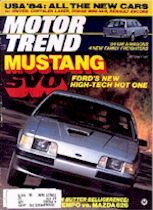 The Mustang SVO was the brainchild of the development team at Ford SVO (Special Vehicle Operations). 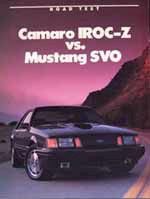 While the SVO was only produced for 3 short years, it has been said "The SVO was the best handling Mustang produced". The picture below is a data and link map. As you click on the highlighted areas in tan below, information will popup in a window. There are also some links to other pages (within SVOCA). As with an undertaking of this size this will be a work in progress. We hope that you will enjoy this new and innovative way the SVOCA is giving you SVO information. Items highlighted in tan are clickable for more information. Some will open a pop-up, others will open a new page, depending on how much info is available. Our numbers may differ from what you've seen elsewhere, but we have VIN numbers to back up our data, Obtained from Ford. The SVO came standard with power assisted disc brakes at all four corners. 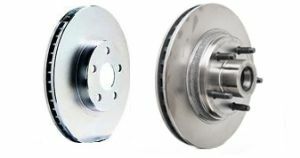 Hub and roter castings are one piece directionally vented for heat dissipation, with 5-lug attaching. The Bi Wing spoiler is one of the unique items of the SVO. 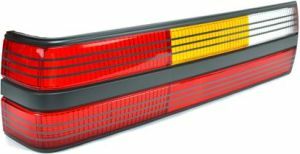 The Mustang SVO received special tail lights. 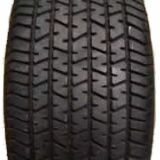 Early SVOs received 225-50-16 NCT radials as used on the Porsche 928. 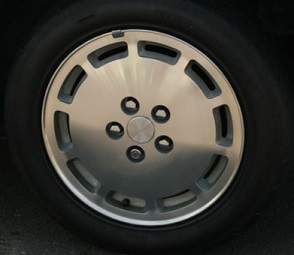 Later in 1984, the SVO would receive it's own unique Gatorbacks created by Goodyear in the same size. 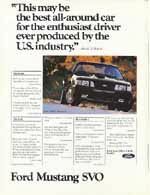 All SVOs came with a 7.5 Traction Loc Differential and 5 lug axles. 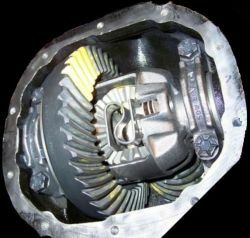 To adjust, the shocks must be removed from one end, collapsed and turned for adjustment. 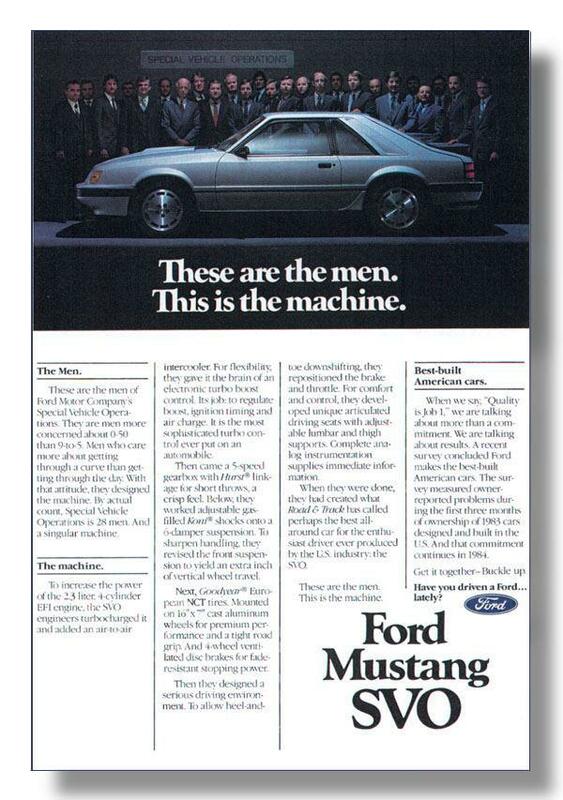 The Mustang SVO was the first Mustang to come from the factory with adjustable shocks. Make sure you look at the details on the front Koni adjustable struts. 84 and 85 SVOs came with single exhaust with dual rear tips. 85.5 and 86 SVOs came with dual exhaust, as shown here. 84, 85, SVOs came with SVO Decals on the rear hatch. Some 84 and 85 SVO's came with the SVO decal on the front fenders. 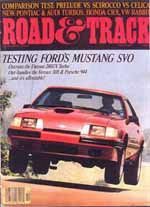 86 Mustang SVO's also received SVO badges on the front fenders as well. 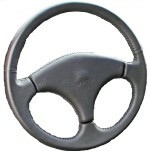 The SVO steering wheel is yet another unique SVO item. The leather wrapped, and SVO embossed horn pad was only used on the Mustang SVO. The SVO Horn pad is embossed with the FORD logo, along with SVO. Mustang SVO's were equiped with unique shifter, shifter boot, and shifter knob designed and provided by Hurst. The shifter was a short-throw, with rubber isolator bushings. The boot is leather stitched, with the HURST logo stamped on the lower right. The knob is leather wrapped and stitched. It shows the standard 5-speed shift pattern, with a Hurst logo stamped on the back. 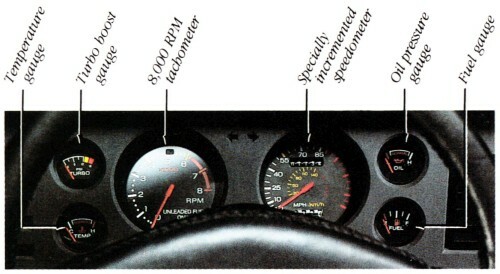 The SVO Gauge cluster was a unique item. It containes a 8k RPM Tach, 140 mph speedometer (Numbered to 85), Standard Oil Pressure, Coolant Temp, and Fuel level gauges, but instead of the stock Volt-meter, it contains a boost gauge. On the left side of the cluster, the Mustang SVO also contains a overboost light, which can be in different locations for different year SVO's. The Mustang SVO came with specially designed seats. SVO seats were available in gray only, and cloth or leather materials. 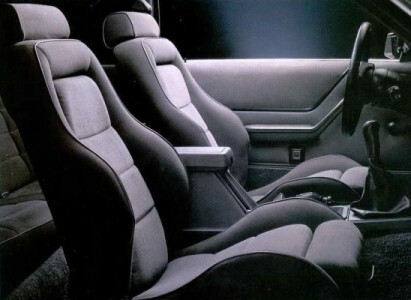 These were 'Recaro like' seats designed by Lear-Siegler for Ford. They have thigh and kidney supports, as well as adjustable knee bolsters. 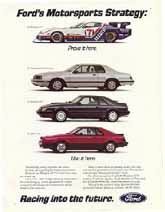 1984 and early 85 SVO's with cloth seats had piping on the seats, while later 85, 85½, and 86 SVO's had the piping replaced with a dove-stitch. The Mustang SVO came with a unique leather-wrapped hand-brake. This complimented the Hurst shifter boot, and shift knob. 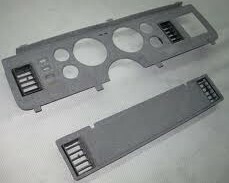 Mustang SVO's came with special FLOCKED dash pannels. These weren't smooth, but rough to the touch. It should also be noted the Comp-Prep models did not have the left inner vent on the passenger side pannel. This is an SVO only item that was provided with the special recaro like seats on the SVO. Lumbar pumps were provided on drivers and passenger side seats. This little pump would increase or decrease the size of the lumbar support in the seat. 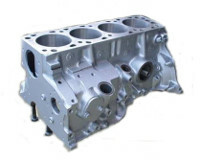 The Premimum sound raido was provided standard in all years of the Mustang SVO. 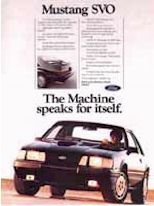 The Radio was similar to the radio in other Fox Mustangs, only the display is RED on all SVO's 1984 and 1985 Mustang SVO's came with Shaft-Style Radios, of which I can't find an image, please forward to the webmaster if you have one handy. Mustang SVO's came with 2 different switch configurations on the console. 84-85 SVO's came with a 3-switch configuration with Amplifier, Foglight, and Fuel switches. 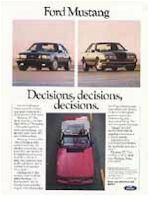 Later 85.5 and 86 SVO's came with 2 switch configuration. One switch for Foglights, and one switch for Fuel grade. All SVO's came with the trip-timer/clock on the right side, with a red lighting. SVO's came with 2 different map lights. All were gray in color, but SVO's equiped with sunroof came with the extra light for the interior light shown on the right. Non sun-roof equiped SVO's came with the model on the left. Mustang SVO's were equiped with handle on the passenger side. We can only assume this was to keep passengers in the seat while the driver is pulling multi-G manuvers. The Mustang SVO received special pedal configuration. Closer brake, and clutch pedals facilitate heal to toe shifting. 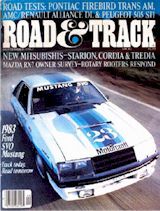 The Mustang SVO also received a dead pedal to the left of the other pedals to help the driver stay in position during hard turns. SVO cloth seats, and door-panels were made with a special material shown above. until recently this material has been very hard to find. SVO leather was also available, and a special diamond cut material was used. Door-panels on All SVO's used the cloth material. 84 and early 85 SVO cloth seats, had piping around the seat seam, while later SVO seats had a dove stitch, show on the right.